Heavily armed separatist militants launched a series of attacks on police headquarters yesterday and Ukrainian forces fought back today. AT LEAST TWO people have been killed and nine wounded in gun battles between Ukrainian special forces and pro-Kremlin militias today. The fighting threatens to scuttle the first international talks on the worst East-West crisis since the Cold War. 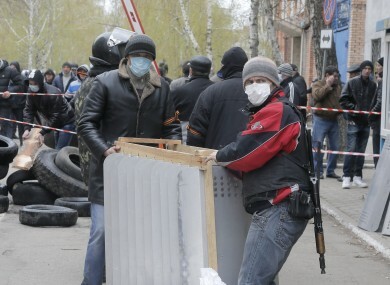 The Ukranian forces had launched the operation after Interior Minister Arsen Avakov hit out at what he called a “display of aggression by Russia” as heavily armed separatist militants launched a series of attacks on police headquarters across the eastern rust belt. “Units from all of the country’s force structures are participating. May God be with us,” the minister wrote on his Facebook page. The highly organised offensive by the pro-Russian men in unmarked military uniforms was reminiscent of that which took place in Crimea in March, fanning fears that Russia is stoking unrest as a pretext to intervene in the neighbouring country. Russia massed up to 40,000 troops on Ukraine’s eastern border after a new pro-Western government swept to power on the back of violent winter protests against pro-Russian president Viktor Yanukovych. Moscow on Saturday warned Kiev against using force against the militants, whose demands range from being granted greater autonomy to joining Russia. Ukraine’s security council met late Saturday for more than three hours to discuss the crisis in the east, but no decision has been announced. Email “At least two dead in firefight between Pro-Russian gunmen and Ukrainian special forces”. Feedback on “At least two dead in firefight between Pro-Russian gunmen and Ukrainian special forces”.